If you haven’t tried lamb or are unsure how you use it, this would be a great recipe for you to start with! It’s definitely not a fussy recipe, it just uses ground lamb that you can find at any supermarket. 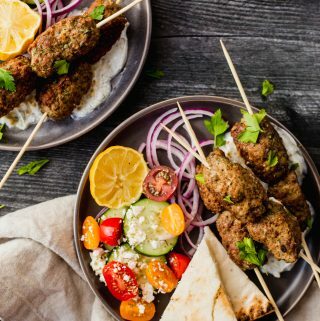 These lamb skewers are incredibly easy and the flavor is out of this world. I say “easy” all the time but it’s really important for me to make recipes that everyone can make. I take pride in that. This would be a good one for those casual dinners on the patio this summer! We love greek flavors: oregano, garlic, red onions, fresh veggies…feta cheese! My husband and I have actually been to Greece before; we went on a cruise through some of the Greek islands when Lucy was a baby. So we got to try the dishes and flavors from the ones who know how to really do it – the Greeks! It’s nice to feel like I’m not missing out on anything because I can make these delicious dishes as home now! Lamb also reminds me of Greece. It has a much more gamey and earthy flavor than ground beef or chicken. It’s true that some people really like it and some people don’t. However, I encourage you to try it at least once if you haven’t had it! Ever since my Celiac Disease diagnosis, I have become much more adventurous in the flavors I am willing to try. Alright so let’s talk about how we’re going to make these lamb skewers. This is a one-bowl meal so you don’t need to get lots of dishes dirty. And don’t ever feel bad about using dried herbs. I certainly don’t! You can still get just as much flavor. However, I do highly recommend that you use fresh garlic in this one because it will turn up the flavor to the next level and give it a little kick. You can serve these with a fresh side salad of tomatoes, cucumbers, feta cheese, a sprinkling of dried oregano and a drizzle of olive oil and balsamic vinegar. We use a brand of olive oil called Horio and we buy it in bulk on Amazon. It was actually recommended by one of my husband’s patients who is of Greek heritage. Our community is also really lucky to have a company called MyBread Bakery that makes gluten-free pita bread that is a great replacement for the real thing. I like to brush it with a little bit of olive oil and then warm it up on both sides on a cast iron skillet over the stove. You can also serve these skewers over some white rice, quinoa or a big bed of greens. Yum!! Another thing to note is that these do not need to be in skewer form, you can make them into meatballs if you want. I use this medium sized cookie scoop for all my meatballs and cookies. 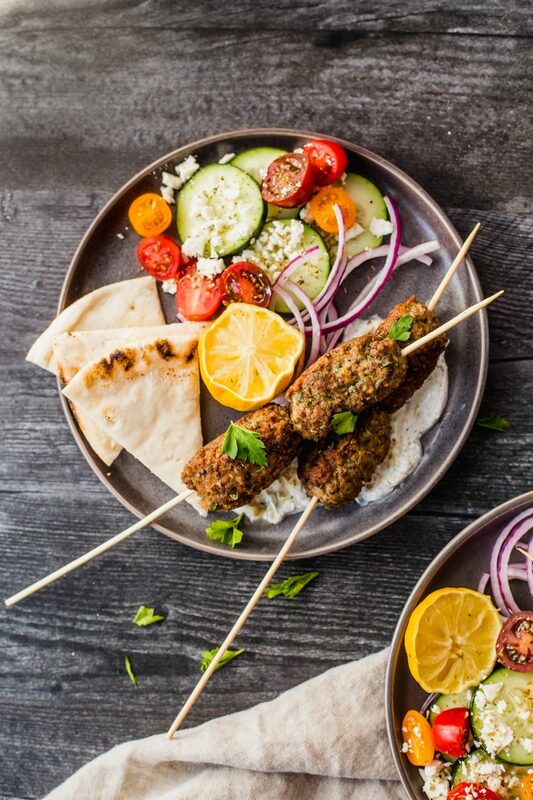 If you’re making them into skewers then you can just take the ball and make it into more of an oval shape and make them as flat or round as you want. For the skewer sticks you can use bamboo skewers or even these sturdy metal ones. I use a little bit of olive oil in a cast iron skillet and brown these on all sides on the stove first. Then I pop them into the oven for just about 10 minutes to finish the cooking process. We’re trying to get the internal temperature to 160° Fahrenheit. If you're new to lamb then this is an easy and super flavorful recipe for you!! 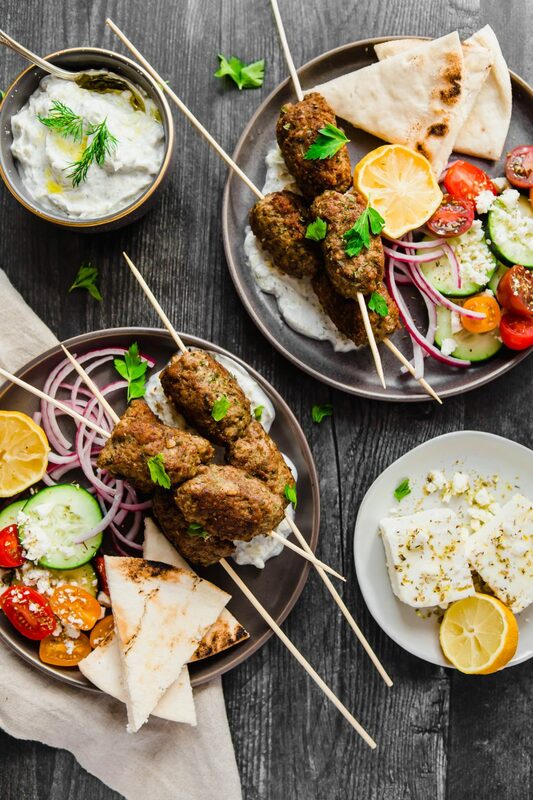 Serve with tzatziki sauce and a fresh and crisp side salad of cucumber, tomatoes, and feta cheese. You'll be blown away with how tasty this is! 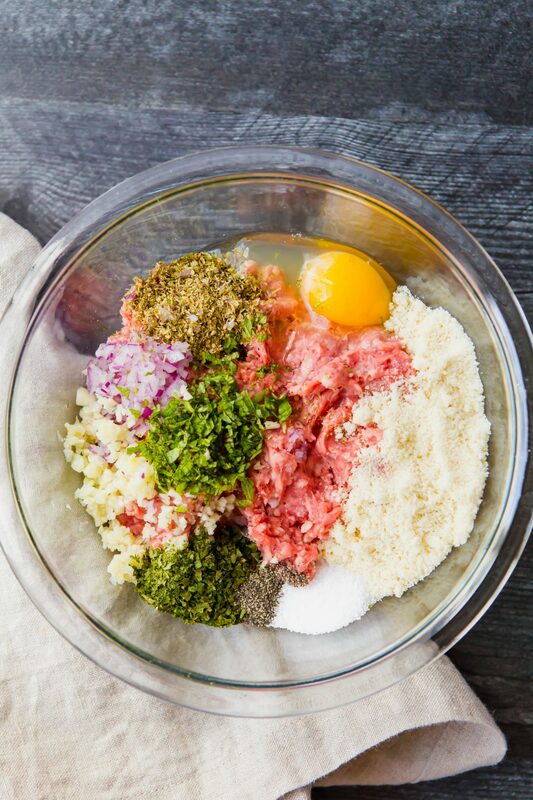 Add ground lamb, red onion, garlic, egg, almond flour, dried oregano, dried parsley, mint, salt, and pepper to a large bowl. Using your hands (probably works the best) or spatula, mix until fully combined. Using a medium sized cookie scoop, make even sized balls. Flatten them out to be more oblong if making skewers. Add a small amount of olive oil to an oven-proof skillet on the stove. Personally, I use a cast iron skillet. Cook about 10 minutes, rotating often so that all sides get browned. Put skillet into a 350° oven and continue to cook for about 10 minutes until you reach an internal temperature of 160°. 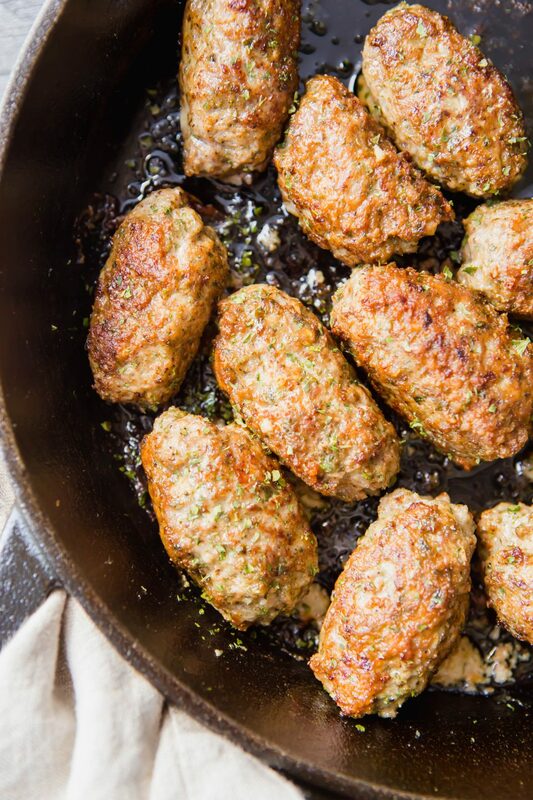 After done cooking, slip 2-3 meatballs onto skewers. Serve with tzatziki sauce and a side salad of cucumber, tomatoes, feta cheese, olive oil, balsamic vinaigrette and dried oregano! Peel the English cucumber and cut the ends off. Cut in half and then scrape the seeds out of the inside. Using a handheld grater, shred the cucumber. Place shreds in cheesecloth or a few layers of paper towels and ring out all the liquid. If you don't, then your tzatziki will get really watery over the next day or two. Add the juice of half a lemon, chopped garlic, and dill and mix until all combined. Season with salt and pepper. 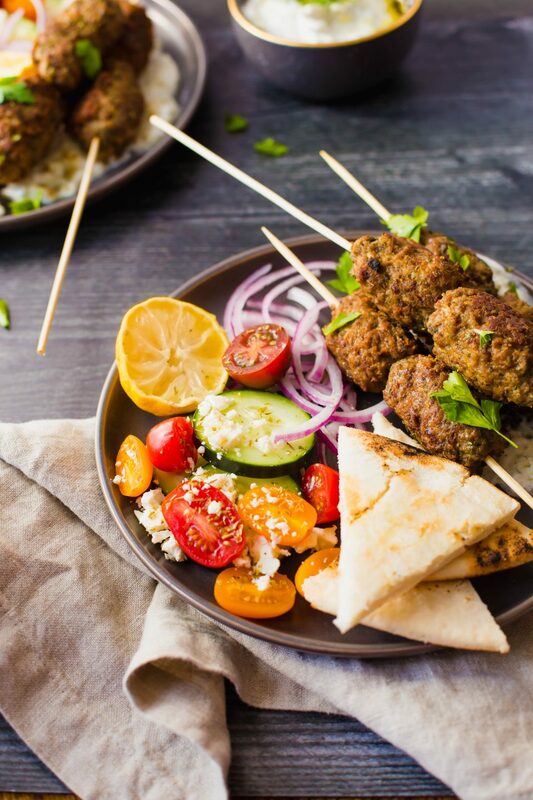 Serve over lamb meatballs or use as a dipping sauce for vegetables and/or pita bread. 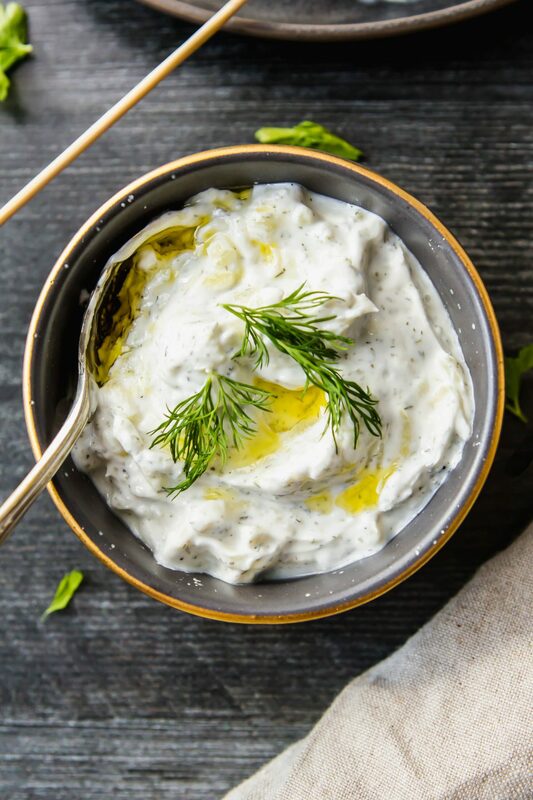 Whip up some of the tzatziki sauce that I explained how to make above and you’ve got yourself a perfect Greek-inspired meal! 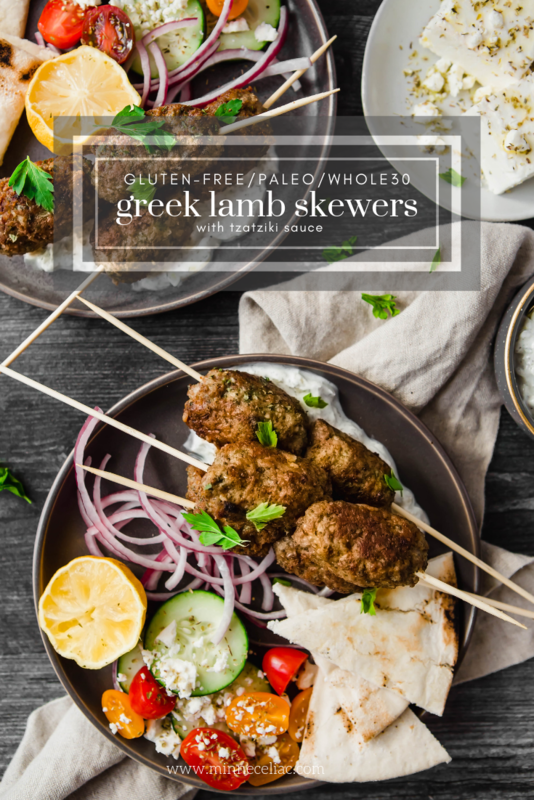 Let me know if you’re interested in seeing more lamb recipes!